Leopard and Olive + a Giveaway! One of the easiest pieces you could ever own in your closet is a great cardigan sweater. A cardigan sweater can be layered over anything and automatically change a basic tee and jeans into a cozy winter look! My favorite type? Something oversized that I can practically live in during the chilly winter months. This cable knit olive version from The Pink Lily Boutique definitely fits the bill! I love perfect oversized fit, the cable knit detailing and the pockets! It’s one of those cardigans that you can wear out, or just wear around the house while watching netflix and eating popcorn! This looks like the perfect cardi! So cozy and I love the color. I have such an obsession with an olive + leopard combo. So much edge! That cardi is so cute! and I love that classic bag! I love the leopard and olive combo! SO cute. Love the scarf and cardigan together. I have two similar pieces and I've never thought of pairing them. Thanks for the inspiration! OMgosh you have snow! Such a cute look with the scarf and hat! I love that cardigan! It is so adorable! That bag is so fabulous! love the green and gray together in this outfit too! That cardigan looks so comfy! Perfect styling! I love your booties too, they're so sleek they look like they would pair well with almost everything! Ohh, I love this look! The oversized green cardigan is perfection. I love olive and leopard paired together! Leopard and olive is one of my favorite combinations! Your outfit is so cute! Sooo jealous of the snow! Such a cute winter #ootd! Great color combo and that sweater looks so cozy! This is such a great combo! And OMG look at all that snow!! Soon jealous! This cardigan looks SO cozy, I need it in my life! That cardi is amazing! I love the knit and color!! Perfect length too! Love this combo of green + leopard!!! Such a cute Fall/Winter look!! I'm loving this look! And the snow really makes the colors pop! Perfect outfit for those cold dreary days! That cardigan is perfect! I love color, fit, and cable texture! love the cozy cardigan with the scarf! That cardigan is so cute!! I love the colour. 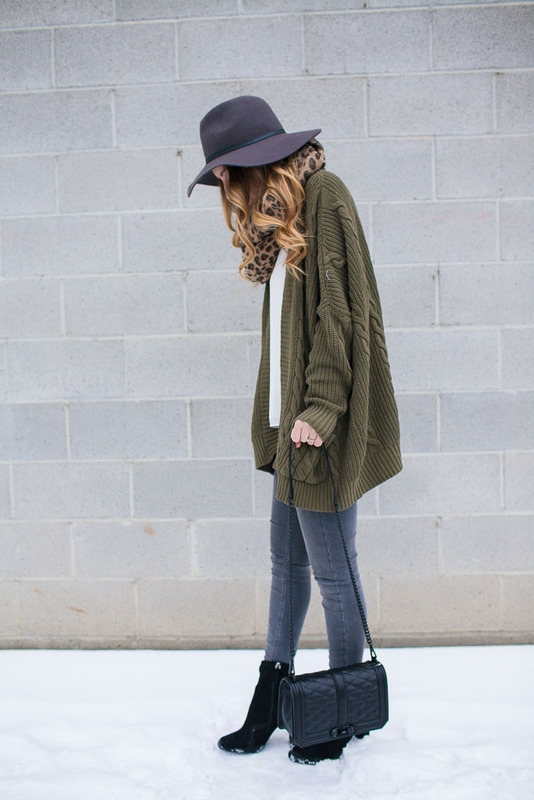 Love that cardigan, such a pretty olive color! You always look so glamorous and chic in hats! This is my favorite color/pattern combo probably ever. You are killin it in hat floppy hat! Olive and leopard are the perfect combo! Love them together! Such a fab giveaway, a win all the way around! I just love this look! You can't go wrong with a big cozy cardigan to keep you warm! Love love LOVE this look on you! You look amazing! !